Connecting a USB device to a Windows 10 computer, laptop, or tablet doesn't always go according to plan. Sometimes Windows 10 won't detect the new hardware at all while at other times it could frustrate you with a variety of error messages. 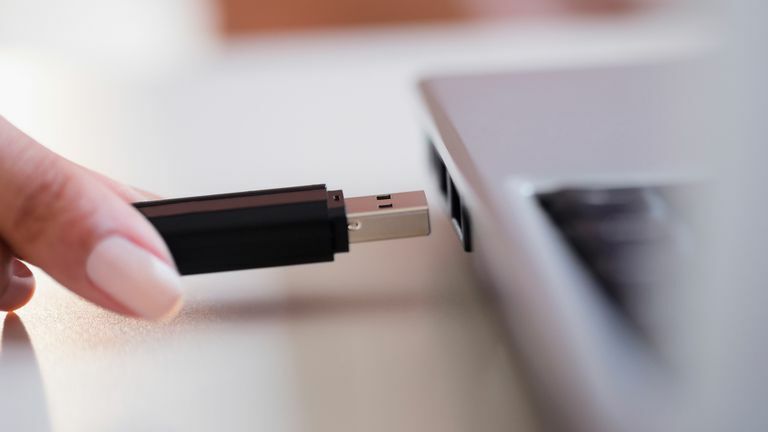 USB connection errors, such as the infamous Code 43 Error message, can have a variety of causes ranging from out-of-date software and drivers to faulty hardware and device conflicts. It can often be hard to tell which issue a USB device is having when trying to connect to your Windows 10 device so it can be a good idea to work through a variety of potential solutions until it begins working properly. Here are some effective solutions that can work when experiencing a USB connection problem with Windows 10. The issues addressed in this article apply to all versions of the Windows 10 operating system and may be experienced when using a range of devices that are required to be connected via USB such as mice, disk drives, fitness trackers, and video game controllers. Restart your Windows 10 device. It's a bit of a cliché but turning your Windows 10 computer or tablet off and on again often does fix problems associated with detecting hardware devices. Turn your USB device on. Most USB devices will turn on automatically when connected to a Windows 10 computer or tablet but some may require you to manually turn them on via a power button. Your computer may not detect certain USB devices if they're turned off. Check the USB device's battery. This is a common problem often associated with wireless USB mice as they're used frequently and can easily run out of power. This issue can often be mistaken for a faulty USB connector when in reality all that's needed is a new battery. If you're using a USB mouse, you can check to see if it has power by turning it over and checking the infrared light which should be visible. Wait until your Windows 10 computer is turned on. Slower computers and tablets can be overwhelmed with the number of operations they need to run when starting up and can sometimes overlook newly connected USB hardware. If you're using a new USB device, wait one minute until your computer has fully turned on before connecting anything to the USB port. Update Windows 10. Updating the Windows 10 operating system can not only download the necessary files to support newly released hardware and devices but it can also fix any errors you may be getting. To check for the latest Windows 10 operating system updates, open Settings > Update & Security and click the Check for updates button. Make sure that the USB device is meant to connect to a Windows 10 computer or tablet. Not all hardware with a USB cable is meant to work with Windows 10. One example would be the Disney Infinity bases which are designed to work with specific video game consoles such as the Xbox One or PlayStation 4. Another would be some of the accessories released for Apple's Mac computers and laptops. Check the USB device's packaging and instruction manual for compatibility information. Troubleshoot. Windows 10 has a built-in tool for detecting errors and conflicts and correcting them. Running the Troubleshoot tool will also scan your device for the required device drivers and will download them if they're available online. To get to the Troubleshoot tool, open Settings from the Start Menu or Action Center, click on Updates & Security, and then click on Troubleshoot. Once on the Troubleshoot screen, scroll down the list of options and click on Hardware and Devices and then click Run the troubleshooter to begin the system scan and repair process. Before running the Troubleshoot process, make sure that the USB device that you're having trouble with is charged, turned on, and connected to your Windows 10 tablet or computer. Replace the connecting cable. Sometimes the cable used to connect a USB device to a Windows 10 computer can become damaged due to wear and tear caused by overuse. This frequently happens to cables that are used a lot such as those made for charging or syncing smartphones. Many USB cables are compatible with other USB devices so you may want to try a cable for another device that you own before paying for an entirely new one. Download drivers from the hardware manufacturer. Some devices require specific drivers to function properly. These drivers could come on a disk packaged with the device when you bought it or you may need to visit the company's website and download them from there. The product's packaging and instruction manual will likely mention the correct website to download the files from. Roll back drivers. Ironically, sometimes installing new drivers can negatively affect the functionality of a device so rolling back the drivers to the previous version can be a solution. Check the power source. Some USB devices, such as some external Blu-ray disk drives, require a lot of power to run so simply plugging them into a Windows 10 laptop's USB port may not be sufficient for them to work properly. Devices like this typically feature two USB cables. One of these should be connected to your computer for transferring data while the other is meant to be plugged into a power outlet with a USB port or another device that can act as a power source. A USB power adapter or a USB hub can be a great investment. They come in a variety of price points and are a very useful tool to have around the house for charging devices without having to use your laptop or desktop computer. Check for USB 3 and USB 2 compatibility. The majority of USB 3 devices can connect to USB 2 ports on Windows 10 computers and tablets so compatibility shouldn't be an issue most of the time. As technology advances, there is the possibility that a USB 3 device may require a USB 3 port however so it's worth checking the packaging and instruction manual to make sure. The majority of USB 3 devices support USB 2 compatibility so this will very rarely be the cause of any connectivity issues. Replace your device. This should be the last resort but it can also often be necessary as sometimes a USB device can just be broken. Fortunately, a lot of companies will send you a free replacement for your faulty hardware if you bought it relatively recently and some may offer free or discounted repair services. If a free replacement or a discount isn't available, this could be the perfect opportunity to upgrade to the latest version of whichever device you need to replace.